We've been RVing as a family for over a decade now. Our girls have grown up looking forward and helping to plan our family RVing trips. In conversation, friends have asked "Why RVing, what made you start?" None of our close family RVs. We didn't grow up RVing or have friends that RV. We did enjoy tent camping, but what started us on our journey to the RVing Lifestyle? Where did we learn how to do this "stuff" that you only do with RVs? And most importantly, where and how do we learn now? As said before, we've been RVing over ten years, but the journey to where we are now started a few years before then. We were volunteers with our church's youth group and took them to a long weekend music festival in the mountains of Central Pennsylvania. Think "Christian Woodstock" and you have a pretty good idea. We had a great time the first two days - but then hard rain storms came - and didn't stop. No matter what we did - we were pretty cramped and moist in our tents. After our damp camping experience, we still tent camped together as a family, but I started yearning for a more enjoyable experience for our young girls. Part of that led me to researching RV trailers on line. Below are the top resources I used in the early 2000s - some which we still use today. Before even owning RoadAbode, one blogger that really got me personally interested in the RVing Lifestyle was George and Tioga. I think George's story is an inspiring one, full of triumph and struggle.George was a cancer survivor, and promised himself that if he beat his cancer, he would travel by RV. Thus began the Adventures of George and Ms. Tioga, his 29 foot Class C motorhome. George had a quirky third person way of writing sometimes, but he wrote every day. The good choices, and the bad. Joys and heartache. George chronicled the daily ins and outs of his nomadic life through the Western United States, and later almost exclusively in Mexico. George is now stationary in Mexico, and no longer lives in Ms. Tioga. George still occasionally writes. Read his blog (especially the years of archives) to discover the hows and whys of his past RVing lifestyle, and transition to living in Mexico. Another resource on the internet was RV.net forums. A forum is a place to ask questions, offer opinions or give assistance to others. I waited for almost a year before posting, just weekly reading the RVnet forums and soaking in the common issues that happen to RVers. The information was great for a total novice like myself. I had no family or friends to ask about how to do things, so the forum let me see some issues I possibly would be running into, what to watch out for when buying an RV and the ways to care and maintain an RV. The site is broken up into "sub-forums" for certain areas of interest. Class A, Class C, 5th Wheel, Trailers, RVing Lifestyle, Workcamping, Attractions Campgrounds and many more areas of interest are covered. I still read and answer questions on the RVnet forum, but feel there are problems with the site. The style has not updated with the times. It looks basically the same as over ten years ago. Sometimes, it is offline for "maintenance." The site is clunky on mobile devices. And some members seem not to get the idea that this forum is a place to gather and share information, for both novices and those that have experience. Recently I asked for information for things to do, and recommendations of places to eat in Delaware near the Rehoboth Beach area. I posted in the correct sub-forum and tried to be as clear about what I was looking for. The first responder told me to "Google it!" This is not what the forum is for,.After, there were lots of people with helpful suggestions, but if I was a "newbie" this could be quite off putting. This is a place to offer assistance. I was looking for the opinions of those like myself, that were of an "RVing Lifesyle" mindset. This is the exchange. This is not a one-time thing, it happens frequently. Another bit of information about RVnet - if you see forums online from Trailer-life, Woodalls, Good Sam or Motorhome magazine, they are all front-end portals to the same database of information. RV.net seems to be the one that updates first and then pushes the information and syncs with the others. Throughout our camping experience after the music festival, I would talk to Amy and our girls of the possibilities of having an RV. Whether a small trailer or motorhome to call our own. I was not sure, but I tried to instill in them that our camping trips could be fun and more comfortable. The first time I saw them realizing how an RV could make camping a different experience, and really excited was our first RV shoow. Back in the early 2000s the RV Show closest to us was based in the Farm Show Complex in Harrisburg PA. We planned a road trip weekend and stayed at budget hotel outside town. When we entered the RV Show we were overwhelmed by the variety and amount of RVs available. 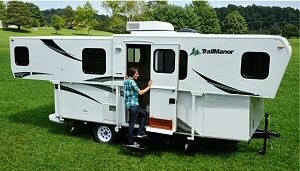 We were really interested in seeing a Trail Manor trailer. Our then current van could tow it (barely) and I liked the idea of a folding, hard-sided home on wheels. We were able to try the process of folding one out. I tried to think how would it be folding out in rain. I didn't like the idea as much as I did "on paper." Going to the RV Show helped to see lots of styles and quality of RVs uin one place. We looked at everything, from small trailers, pop-ups, and then Class C and A motorhomes. It was looking and sitting in motorhomes that excited us all the most. The girls imagined how they would sleep in the bunks, while Amy and I dreamed of the adventures we could do as a family. Being "self contained" really seemed to suit our desires. We just had to figure out how to afford one! I started to research online RV dealers. Back then there were fewer choices in our area to check out on the internet as there are now. Between the pricing information at the RV Show we had attended, and the online RV dealers we started to get a sense of pricing. I also researched on Ebay, but only looked at closed or completed sales. This gave us more of an indicator what was a good value in the used market. It was one of those online dealers that we found about used rental motorhomes. It's how we found RoadAbode. For campgrounds, besides looking at recommendations on RVnet, we also found RV Park Reviews. A simple website, it's a good starting point to find some other RVers likes and dislikes about a park. Just like other review sites, there are some people that only post poor reviews, or seem to have a personal problem with a park. Some people seem extremely nit-picky. We try to read other reviews the person has written. Do they seem to have a vindictive way about them, or are other reviews of the same camp resort on par with their feelings? The way we research and ask questions, in the time we've been RVing, we've only had a few experiences where we felt a campground could have done better. And anyway, a bad day of camping still beats a good day at work! We love to read in our family, and researching by books was still the way I gathered information. I still read books, but now they are electronically on my handheld device, rather than ink and paper. In our early years, I read not just RV Repair & Maintenance of the plumbing and electrical systems of an Recreational Vehicle, but also books about RV travel, like Steinbeck's "Travels with Charley" and Least-Heat Moon's "Blue Highways." These are still favorite books today. After purchasing RoadAbode, I subscribed to Motorhome Magazine. I was always excited to read the latest articles, or check out new features. Since we also have Good Sam Road Service we would get the Good Sam quarterly magazine as part of the service..They were fun magazines to read, but most information is available on line now. We've only purchased one DVD to learn how to do things for our RV. That was on how to setup our Towbar to tow our Honda behind RoadAbode. Mark Polk of RV Education 101 has some great DVDs, and does plenty of how-to videos for RV companies and manufacturers. I now enjoy watching his YouTube Channel, and hopefully will be following his video tips on coating RoadAbode's roof in late spring. We purchased RoadAbode in November 2004, at the end of camping season. Once we had her in storage, we could do reading and really explore how we were going to use her. That's when I started this blog - here's the first post! Our first real camping trip was to Spring Gulch in Lancaster PA April of 2005. It was now time to start learning by doing! Learning by doing will be a process for any RVer. No matter how much you have read, or people explain how things work, you will find certain ways you will tweak procedures to fit your own style of RVing. For us, figuring out the right order of setup, who gets what job when first pulling into a campsite is part of the fun. That's how we learned early on to start RVing. But plenty has changed. 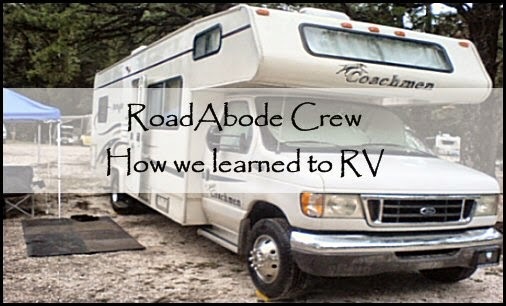 Coming in Part Two, we'll explain how the RoadAbode Crew is still learning to RV, and how our perspective of the RV LifeStyle is changing over the years, and what we are looking to in the future. So how did you learn to RV? Did you have a mentor? What got you into RVing, and what keeps you in the RVing Life? We'd love to hear about, and learn from your experiences! Please comment below!